NASHVILLE, Tenn. (WKRN) - - If you are using Amazon to put presents under your tree, you'll want to hang on to those shipping boxes. After the holidays are over, you can re-use them to help clear your clutter and make a charitable donation. Amazon and the company Give Back Box are making it super easy for you. Give Back Box will take your items and ship them for free to Goodwill. 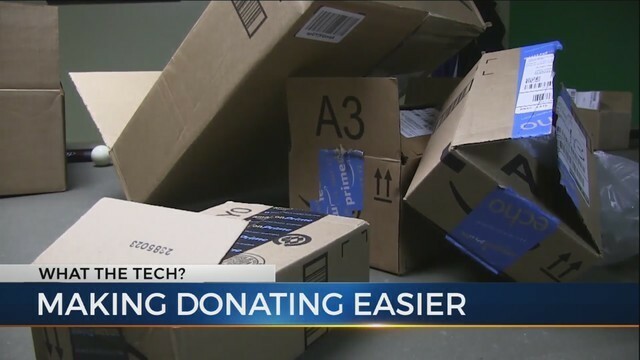 Amazon is just one of about a dozen companies partnering with Give Back Box to drive up donations while making it easy on the donor. Stuff as many items (good quality please) into the used Amazon box as you can. Give Back Box and Goodwill cannot accept donations of electronics, fragile or hazardous items and certainly no liquids or ammunition. Give Back Box says there's no weight limit, so stuff those sturdy boxes full. Go to www.givebackbox.com and print out a free shipping label. You don't have to register to download a shipping label but the site does ask for some basic information such as your zip code and e-mail address. Give Back Box uses your zip code to locate the nearest participating Goodwill donation center. Once the shipping label is downloaded, you can tape the label to the sealed box and take it to your nearby post office. You can also schedule a doorstep pick-up. It couldn't be easier to make a donation to the charity. If you'd like a tax receipt you will need to sign up and register with Give Back Box and they'll send you one by e-mail. Also, by using the Amazon box a second time it's better for the environment. Give Back Box will print shipping labels for any cardboard box you have provided it's sturdy enough to hold what you're shipping.